Here is some more connecting the dots in the business of climate modeling. This is hardly a reassurance that core players think that the science is settled. Most important is the apparent complexity of the linked events. This is very sophisticated and promises years of sleuthing. Surely no one thinks we are about to run out of connections to link up. And that is the point. These type of links are seductive, yet a sudden change elsewhere might totally change all of them as we disappear into the world of fine detail. At least the climate models must be getting more realistic. Subtle connections between the 11-year solar cycle, the stratosphere, and the tropical Pacific Ocean work in sync to generate periodic weather patterns that affect much of the globe, according to research appearing in the journal Science. The study can help scientists get an edge on eventually predicting the intensity of certain climate phenomena, such as the Indian monsoon and tropical Pacific rainfall, years in advance. The answer, according to the new study, has to do with the Sun's impact on two seemingly unrelated regions. Chemicals in the stratosphere and sea surface temperatures in the Pacific Ocean respond during solar maximum in a way that amplifies the Sun's influence on some aspects of air movement. This can intensify winds and rainfall, change sea surface temperatures and cloud cover over certain tropical and subtropical regions, and ultimately influence global weather. "The Sun, the stratosphere, and the oceans are connected in ways that can influence events such as winter rainfall in North America," says NCAR scientist Gerald Meehl, the lead author. "Understanding the role of the solar cycle can provide added insight as scientists work toward predicting regional weather patterns for the next couple of decades." The study was funded by the National Science Foundation, NCAR's sponsor, and by the Department of Energy. It builds on several recent papers by Meehl and colleagues exploring the link between the peaks in the solar cycle and events on Earth that resemble some aspects of La Nina events, but are distinct from them. 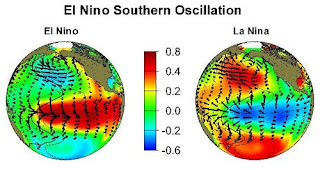 The larger amplitude La Nina and El Nino patterns are associated with changes in surface pressure that together are known as the Southern Oscillation. The connection between peaks in solar energy and cooler water in the equatorial Pacific was first discovered by Harry Van Loon of NCAR and Colorado Research Associates, who is a co-author of the new paper. The new contribution by Meehl and his colleagues establishes how two mechanisms that physically connect changes in solar output to fluctuations in the Earth's climate can work together to amplify the response in the tropical Pacific. The team first confirmed a theory that the slight increase in solar energy during the peak production of sunspots is absorbed by stratospheric ozone. The energy warms the air in the stratosphere over the tropics, where sunlight is most intense, while also stimulating the production of additional ozone there that absorbs even more solar energy. Since the stratosphere warms unevenly, with the most pronounced warming occurring at lower latitudes, stratospheric winds are altered and, through a chain of interconnected processes, end up strengthening tropical precipitation. These stratospheric and ocean responses during solar maximum keep the equatorial eastern Pacific even cooler and drier than usual, producing conditions similar to a La Nina event. However, the cooling of about 1-2 degrees Fahrenheit is focused farther east than in a typical La Nina, is only about half as strong, and is associated with different wind patterns in the stratosphere. Earth's response to the solar cycle continues for a year or two following peak sunspot activity. The La Nina-like pattern triggered by the solar maximum tends to evolve into a pattern similar to El Nino as slow-moving currents replace the cool water over the eastern tropical Pacific with warmer water. The ocean response is only about half as strong as with El Nino and the lagged warmth is not as consistent as the La Nina-like pattern that occurs during peaks in the solar cycle. Solar maximum could potentially enhance a true La Nina event or dampen a true El Nino event. The La Nina of 1988-89 occurred near the peak of solar maximum. That La Nina became unusually strong and was associated with significant changes in weather patterns, such as an unusually mild and dry winter in the southwestern United States. The Indian monsoon, Pacific sea surface temperatures and precipitation, and other regional climate patterns are largely driven by rising and sinking air in Earth's tropics and subtropics. Therefore the new study could help scientists use solar-cycle predictions to estimate how that circulation, and the regional climate patterns related to it, might vary over the next decade or two. To tease out the elusive mechanisms that connect the Sun and Earth, the study team needed three computer models that provided overlapping views of the climate system. One model, which analyzed the interactions between sea surface temperatures and lower atmosphere, produced a small cooling in the equatorial Pacific during solar maximum years. The second model, which simulated the stratospheric ozone response mechanism, produced some increases in tropical precipitation but on a much smaller scale than the observed patterns. The third model contained ocean-atmosphere interactions as well as ozone. It showed, for the first time, that the two combined to produce a response in the tropical Pacific during peak solar years that was close to actual observations. "With the help of increased computing power and improved models, as well as observational discoveries, we are uncovering more of how the mechanisms combine to connect solar variability to our weather and climate," Meehl says.